The most remarkable sightseeing tour of the world! Tickets for the Floating Dutchman are temporarily not available! Is it a boat or a bus… It is the Floating Dutchman! 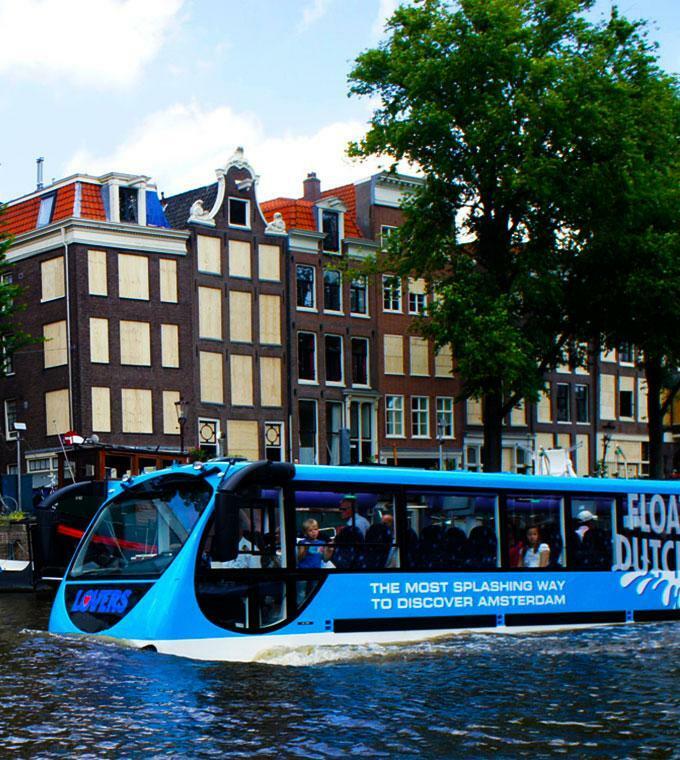 Hop on this amazing bus passing the Amsterdam highlights and combine it with an exciting canal cruise. The Floating Dutchman is a an ultra-modern amphibious vehicle which makes it possible you get a tour in Amsterdam by bus and boat and never have to leave the vehicle. It is the most original and spectacular way to get to know Amsterdam. The excursion departs from Amsterdam Central Station where the bus will guide you through the old city center to the ‘Splash Zone’ at the Oosterdok near NEMO. At the ‘Splash Zone’ the Amphibibus will splash into the water and from this moment on the canal cruise will sail past NEMO, the Maritime Museum, the river Amstel, the skinny bridge and the Hermitage. The Floating Dutchman will also take you to the Craft & History Experience where traditional Dutch crafts are demonstrated. You can also enjoy the Dutch delicacy ‘poffertjes’, or get in the time machine and experience the history of the Netherlands. The Floating Dutchman will end the 45 minute canal cruise by guiding you back to Amsterdam Central Station. A live tour guide is available in two languages: Dutch and English. Please note: the Floating Dutchman is not wheelchair accesible. The Floating Dutchman departs from Central Station (Prins Hendrikkade 25, west side from Central Station from the jetty and close to the taxi stand. Show your ticket at the Lovers desk). 10.00h – 12.30h. – 15.00h. - 17.30h. Van Gogh Museum Skip the line tickets!